The FedEx Racing team was relentless in tuning their #11 Toyota, took advantage of excellent fuel mileage and timely cautions, and used a brilliant late-race drive from Denny Hamlin to score its first victory of the 2011 NASCAR season Sunday at Michigan International Speedway. Quick work on pit road for two tires during the final caution with eight laps remaining gave Hamlin the lead for the final restart, and he held off a hard-charging Matt Kenseth over the final five laps en route to victory lane. Running in the back half of the top-10 as the laps dwindled, the 30-year-old driver moved up spots while cars in front of him were forced to pit road for fuel with less than 50 laps to go. Hamlin got up to fourth before a caution on Lap 160, when everyone came back in for fresh tires. The FedEx crew held serve, and Hamlin climbed two spots to second on the restart. Trailing Carl Edwards and conserving fuel to make it to the end, an incident on Lap 191 bunched the field again, and when the cars came to pit road one final time, the two-time defending Pit Crew Challenge winners sprung to action, getting Hamlin out first for the dash to the checkered flag. 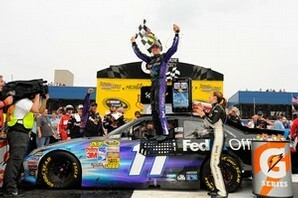 The victory is Hamlin’s first of 2011, second at Michigan and 17th of his Sprint Cup Series career. He climbed three spots to ninth in the NASCAR standings, now trailing leader Edwards by 77 points after 15 of 26 regular season races. The series returns to action on the road course at Infineon Raceway, June 26.